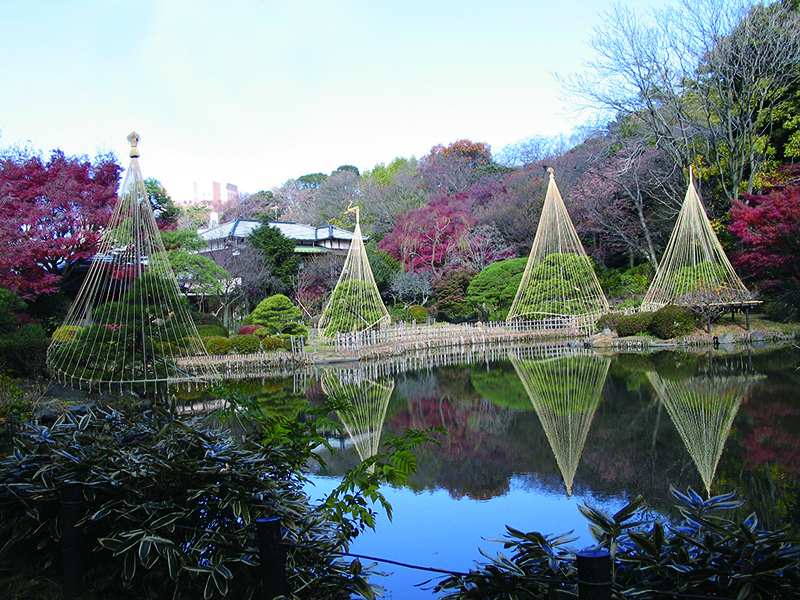 In late November, straw ropes are stretched from the top of pine trees planted around the pond to the lower branches to prevent their breaking under heavy snow. The process of stretched ropes taking the shape of an umbrellais worth watching. This place had been used as a residential site for a retainer of the Shogunate since the mid-Edo period. In the late Edo period, the suburban residence of the Shimizu family, one of the three counts of the Tokugawa family, was located here. Later, it became the suburban residence of the Hitotsubashi family and then that of the Hosokawa family, the feudal lord of Higo Kumamoto (540,000 koku). After the Second World War, the owner of the site changed several times. In September 1961, a Tokyo metropolitan park opened on the site, and in April 1975, the jurisdiction over the park was transferred to Bunkyo City. The view from Shouseikaku has remained the same since the Meiji period: a pond in front, a grove on the left slope, and some lanterns. 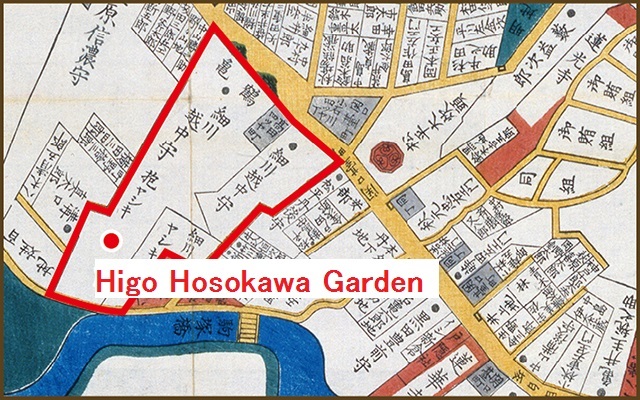 Comparison between the view and the picture passed down to the Hosokawa family will show the history of the garden. Please compare the map on the right with the picture map at the bottom. ①It offers a three-dimensional view created by leveraging the change in the landform of the plateau as a mountain. 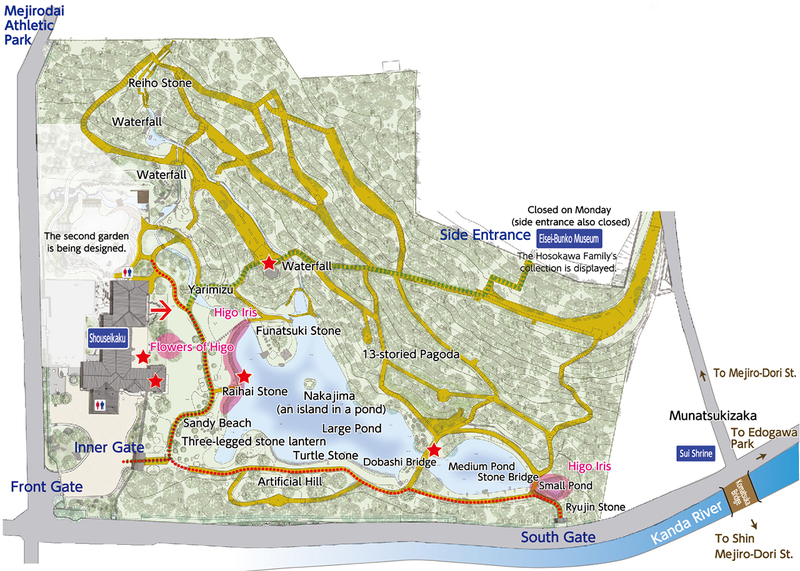 ②It is a circuit style garden around a big pond, and part of the path looks like a worn line. In spring, red and white plum blossoms bloom, followed by cherry blossoms that turn part of the mountain pink. Then comes a season of fresh greenery. In early summer, flowers, such as the Higo iris, brighten the garden, and in autumn, the garden becomes ablaze with autumnal colors of Japanese wax and maple leaves. Then comes yukitsuri of pine trees, a winter feature. Visitors can enjoy a beautiful view of the garden that changes from season to season. 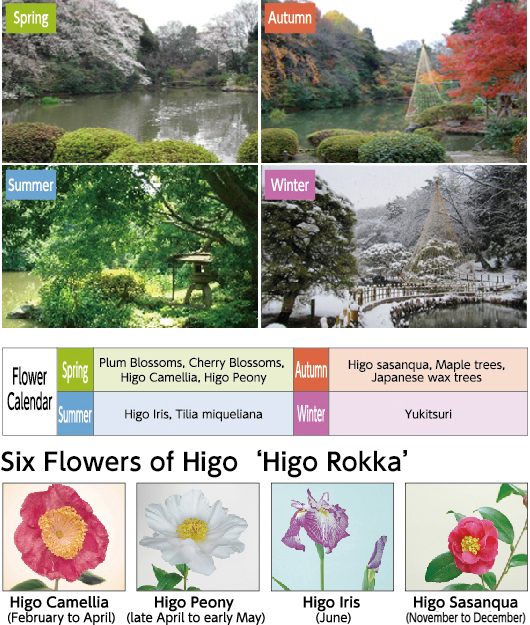 Among the six types of Higo flowers that have been improved through breeding since the Edo period, Higo camellia, Higo peony, Higo iris, and Higo sasanqua can be seen in this garden. ・Doing business in the park, such as the sale of goods, is prohibited. ・No pets are allowed in the park. ・Smoking is not allowed in the park. ・There is no visitor parking in the park. 「Shouseikaku」：9:00 a.m. to 9:00 p.m. Observation floor is open until 5:00 p.m.
•Tokyo Metro Yurakucho Line: Get off at Edogawabashi Sta. (Y12) (15 minutes on foot from the station). •Toden Arakawa Line: Get off at Waseda Sta. (5 minutes on foot from the station). 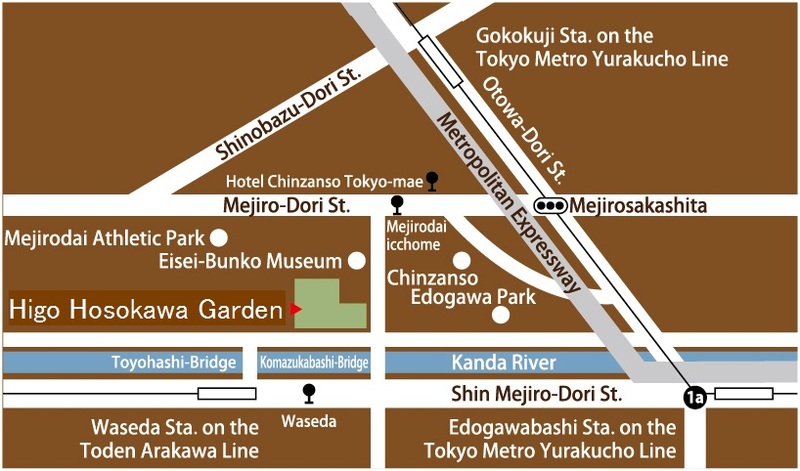 •B-guru (community bus): Get off at Mejirodai icchome (5 minutes on foot from the bus stop). •Toei Bus: Get off at Waseda (5 minutes on foot from the bus stop). •Toei Bus: Get off at Hotel Chinzanso Tokyo-mae (7 minutes on foot from the bus stop).